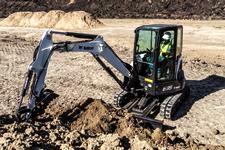 Operator-friendly controls in R-Series compact (mini) excavators are designed for simplicity, flexibility, and maximum productivity. Whether you’re digging, backfilling, or operating an attachment that requires secondary hydraulics, you’ll notice that the joysticks, travel control pedals, and attachment controls have been designed to keep you productive all day long. 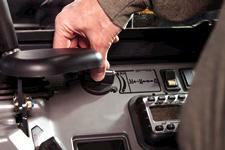 The auxiliary hydraulic controls are at your fingertips, providing precision control and low-fatigue operation. 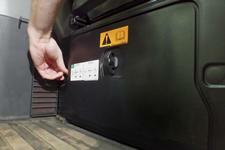 Variable flow allows you to control the attachment speed and precisely move a clamp. Detent provides continuous flow for attachments such as augers and plate compactors. 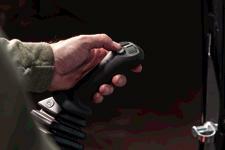 A secondary auxiliary thumb toggle lets you switch between the second auxiliary and the boom-offset without letting go of the joystick. You don’t have to stop what you are doing to search for the switch as it is located at your fingertips on the left joystick. 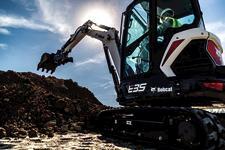 You can feel the quality at your fingertips, as the joysticks on R-Series excavators are designed to feel better in your hands and provide effortless control to the workgroup. They’re made from soft-touch materials that provide lasting comfort. Access to the pattern control selector is easier than ever. 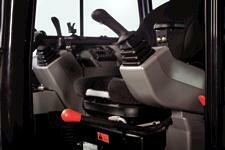 The easy-access location lets you choose between ISO and Standard patterns without leaving the operator’s seat. No keys or special tools are required. Blade float exerts a minimal, consistent down-force on the blade without operator input, making leveling and back dragging quick and easy. When you’re traveling, use the pedals to control your speed with precision. When you’re working, fold them up to get them out of the way. Hydraulic joystick control on R-Series compact (mini) excavators delivers smooth, fluid operation and increased efficiency. Provides continuous flow for attachments in either direction, allowing you to operate attachments without continually pressing a button.